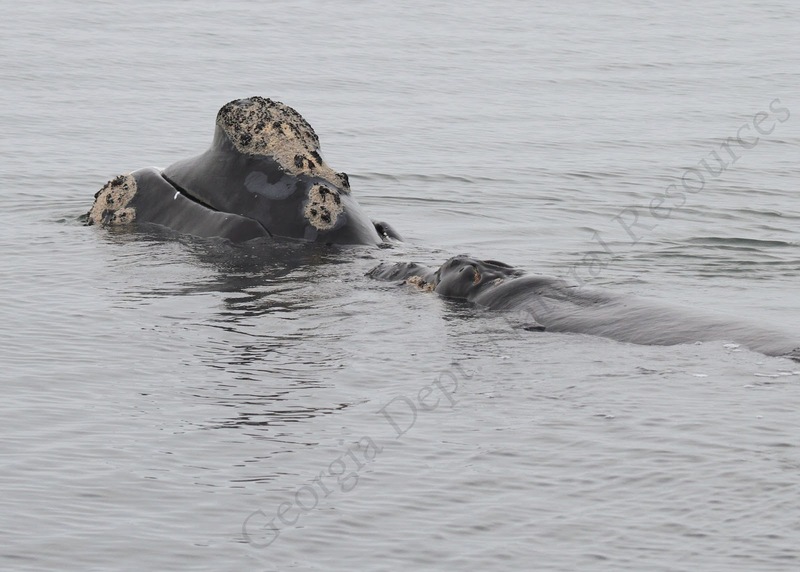 As the end of March approaches, the few right whales that remain down on the calving ground off Florida and Georgia begin heading north along the coast to their feeding grounds off Massachusetts. 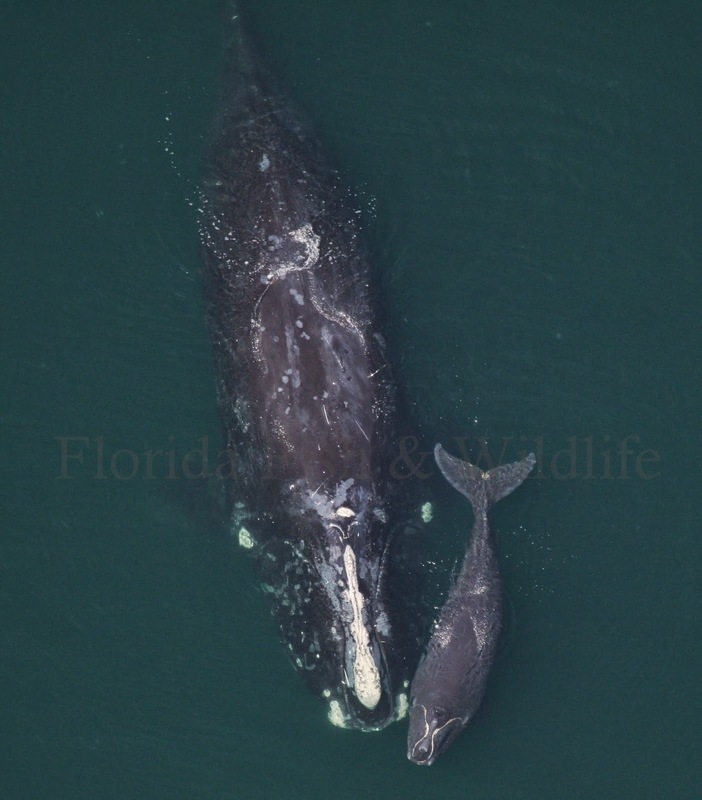 Southern survey teams (FWC, GDNR, the Marineland Right Whale Project, Sea-to-Shore Alliance, UNCW, and others) report a relatively quiet season this year with only 50-60 whales seen and 10 calves documented. Although the number of whales seen the year before was roughly the same, the number of calves this year is half of what was born last year. Sadly, this relatively low calving count was made even smaller by the loss of #1301's calf (read about the unusual history of this whale from this previous blog). Similar to two years ago, #1301's calf looked thin at its last sighting and then #1301 was later seen without it. Mono (#1321) with her adorable 2014 calf. Photo: Florida Fish and Wildlife Conservation Commission, taken under NOAA Research Permit #15488. We hope the remaining calves fair better- many were born to experienced moms such as Naevus (#2040) [pictured above], Mono (#1321) [pictured below], Couplet (#2123), and Boomerang (#2503). You can see photos and sighting histories of these whales and all the others in the North Atlantic Right Whale Catalog at the Catalog web site. Nauvus (#2040) shows part of her head, with her one month-old calf at the surface. Photo: Georgia DNR, taken under NOAA Research Permit #15488. Three other females that have calved in previous years were seen in the area, but never with a calf. It is possible that they did calve but were simply missed afterwards. We'll be looking for these three up north to see if they have a young one in tow. There were also a few females who have likely reached reproductive age but have not calved previously. One of them, Caterpillar (#3503), had the right whale community concerned. She was named for a large propeller scar on her side that looks like the tracks from a Caterpillar tractor. Caterpillar, with propeller wounds on her side. Photo: Heather Foley, New England Aquarium. Although she has seemed in good health since she received the wound, we were concerned that if she were pregnant and her girth increasing, the wound could further open and become infected. This happened to the right whale Lucky (#2143), proving that even if a right whale survives the initial propeller wounds, those wounds can still cause problems later in life.Caterpillar was only seen once, so we are hoping she made a quick visit to the area and is safely feeding somewhere up north. We wish this year's calves and their moms a safe migration and eagerly await their arrival on the feeding grounds. You can keep tabs on their progress by going to the Northeast Fisheries Science Center interactive sighting map- if you zoom in on the area near Cape Cod and see the symbol of a small fluke next to a larger fluke- you'll know the mom and calf pairs have arrived! Labels: calves, Calving, Calving Ground, Philip, southeast U.S.